As long as I had my Florentine paper out, I thought I would make another card with it. It's just so pretty that it's hard for me to put it away! I used the Cricut Art Philosophy cartridge quite heavily on this card. The card base/layer, butterfly, butterfly layer, flowers, and banner strip were all die-cut. 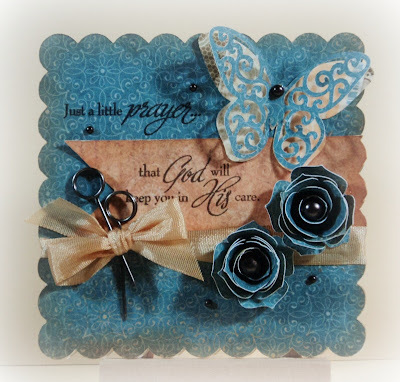 It's so fun and easy to put a card together using the Art Philosophy cartridge! Again, I sponged some color-ready seam binding ribbon and finished it off with a couple of foundry pin clips. The stamp set is Card Chatter-Sympathy and the gems are from the Mocha collection. Ok, I promise that tomorrow I will put the Florentine away and pull out one of the other new papers! Maybe I'll put out Victory - a nice masculine paper - to balance things out. Thanks for stopping by today - I always appreciate the time you spend here!